Come snuggle up in the coziness of this creek side cabin! A cozy and intimate retreat awaits at Beary Cozy. This cabin is the perfect setting for a weekend getaway in the woods. A creek rushes in the backyard, a tranquil pond sits across the road. Find yourself on the front porch listening to the sounds of nature. In the cooler months, cuddle up inside with a good book or some hot cocoa in front of the fireplace. Comfy bedding and cozy furnishings await as the night rolls in. In the morning, wake up refreshed to some breakfast easily prepared in the fully equipped kitchen. 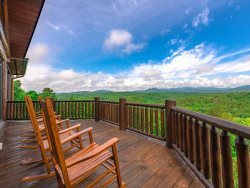 Spend some time on the screened in porch and let the sounds of the creek take you to your happy place. Come get your cozy on at Beary Cozy! I called a couple of times before our arrival date, and my questions were answered very nicely. Very friendly people. We loved it. The pond and the creek made our stay very relaxing. The house was great. Little notes scattered about explained what everything was for. Great house for a small family or for just two. The cabin was very clean and conveniently located near Downtown Blue Ridge. We would definitely recommend this cabin. Everyone was personable and knowledgeable in helping us. The property was exactly as described. It was beautiful and absolutely perfect for our family. Would definitely recommend. The booking and payment process was easy and user friendly. The only issue we had was finding the property. The directions given to us advised not to use the GPS. The directions were fine until the last turn, which took us in numerous circles and turns. The WAVE GPS took us the back way thru Joann Sisson, instead of Maxwell Rd, which took us directly to the property with no turns. Very like to recommend. This cabin was absolutely amazing and we are considering this for future getaways. Since I walk with a walker, my caregiver handled all the details. She felt that everyone was friendly. and was very helpful. My caregiver did all the cooking and especially loved the new stainless steel appliances. Robyn is a gourmet cook , so we all ate delicious at the cabin especially the grilled steaks and taking in some of the restaurants also, especially the new Mexican restaurant that opened next to Ingles in Blue ridge, Ga. It was top notch. Loved everything. All was nice with the cabin... but the traffic driving pass the cabin was a little much at times. Everyone was extremely friendly and helpful. The courtesy call the day after we arrived was the first one weve ever experienced. You receive 5* for that alone. Plan to come back to Beary Cozy Cabin to enjoy it each season of the year. Staff was always friendly and very happy to help. It was a very relaxing and fun vacation. My daughter played in the creek , skipped rocks. We cocked out , caught lightnin bugs, used the fire pit. Just had a good ol time. Thank you! The rental company was very professional in all of its dealings, yet had a personal, friendly touch that I appreciated. I talked with various folks on the phone, and they, along with Jerry at check-in, were all friendly and helpful. SCCR_Beary_Cozy had a great use of space and was well appointed with lovely furnishings. Everything was spotless and in good working order. I especially liked the little tags placed around the cabin that had instructions and labels for various lights, appliances, drawers, etc. It was truly a very nice place to stay. Highly recommended! Jerry was awesome, he was really friendly and helpful and funny. Everyone was very friendly and easy to work with. Loved this property. We loved sitting on the back porch and hearing the creek. The cabin has everything you need. Im terrible with names but, if I am not mistaking, Ashely at Southern comfort assisted me both when I booked and check in. She was amazing! Best stay I have had in a long time, cannot wait to come back! We worked with Ray and found him to be very friendly, helpful and good at his job. He was a pleasure to work with. We had a wonderful time and it was hard to leave all that peace and quiet. We look forward to coming again very soon. We have stayed at many cabins in the mountains, but we were never this happy. The beds were comfortable, which is a nice change from many of the places we've stayed before. Thank you! This cabin was cozy and perfect for our family of 4. It was a great location and had beautiful surroundings. We enjoyed the fire pit in the yard as well as the kids playing outside. The back porch was so peaceful and relaxing overlooking the stream. We enjoyed our stay very much! You all were so sweet and helpful! We loved the cabin and will definitely be back! Team was excellent and very helpful! Awesome cabin. The BMT runs right by it and makes for a fun little hike. Very clean and nice. Remote control fireplace was a nice little touch.